Joint UN-Arab League Special Envoy on Syria Kofi Annan. The Joint Special Envoy of the United Nations and the League of Arab States for Syria, Kofi Annan, today said he will send a team to the country at the weekend to continue discussions on proposals he has presented to the leadership as he tries to find a peaceful solution to the year-long bloody conflict. “I will be sending in a team this weekend to pursue the discussions and the proposals we left on the table, and at the appropriate time, when I deem sufficient progress has been made, I shall be prepared to go back to the region,” Mr. Annan told reporters in Geneva after briefing the Security Council in New York through video-link. He said his immediate objectives are to try to stop the violence and human rights abuses and to make it possible for humanitarian assistance to be delivered to those who need it inside Syria. That should be followed by the “all-important issue of a political process that will lead to a democratic Syria fulfilling the aspirations of the Syrian people,” he said. On Wednesday, Mr. Annan said he had received a response from the Syrian authorities on issues he raised when he visited the country last weekend and that he had sought further clarifications. 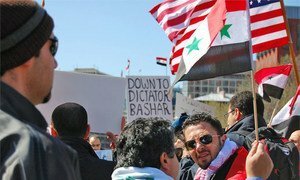 While in Damascus, the Syrian capital, he had urged President Bashar al-Assad to embrace change and reforms that will form the foundation for democracy in his country. Secretary-General Ban Ki-moon yesterday marked the first anniversary of the uprising by reiterating his call for an end to the bloodshed and a peaceful resolution of the crisis. “It is urgent to break the cycle of violence, stop military operations against civilians and prevent a further militarization of the conflict in Syria. The status quo in Syria is indefensible,” said a statement issued by the Secretary-General’s spokesperson. At today’s news conference, Mr. Annan also said he was encouraged by the Security Council’s strong support and determination to work together on the crisis. “There have been some differences, but that is also normal, and I hope pretty soon you will be hearing one voice from the Council,” he said. The 15-member Council has so far been unable to agree on collective action on Syria. Secretary-General Ban Ki-moon today marked the anniversary of the uprising in Syria by calling for an end to the ongoing bloodshed, which has claimed more than 8,000 lives since popular protests began a year ago, and for a peaceful resolution of the crisis.